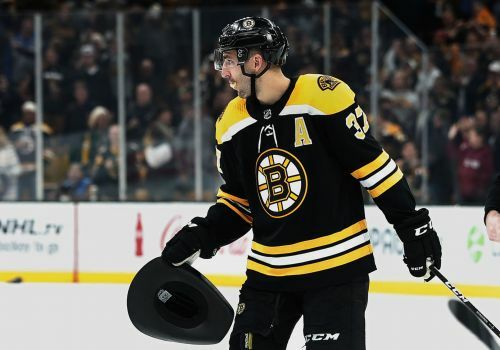 BOSTON (AP) — Patrice Bergeron had a hat trick, scoring his first just 30 seconds into the game, and Tuukka Rask stopped 28 shots to earn his first win of the season while leading the Boston Bruins to a 6-3 victory over the Ottawa Senators on Monday. BUFFALO, N.Y. (AP) — Jack Eichel scored two goals to lead Buffalo Sabres to its second straight win. NEW YORK (AP) — Robin Lehner stopped 35 shots for his ninth career shutout in his New York debut, leading the Islanders over San Jose. ANAHEIM, Calif. (AP) — Rookie Troy Terry scored the only goal in the shootout, John Gibson made 19 saves and Anaheim celebrated the home opener of their 25th anniversary season with a victory. Jakob Silfverberg scored the tying goal with 11:31 to play, and Hampus Lindholm also scored as the Ducks improved to 3-0-0. The 21-year-old Terry then scored a shootout goal in his fifth NHL game, and Gibson stopped all three Red Wings shooters. Tyler Bertuzzi and Darren Helm scored and Jimmy Howard stopped 24 shots for the Red Wings, who are winless in their first three games.